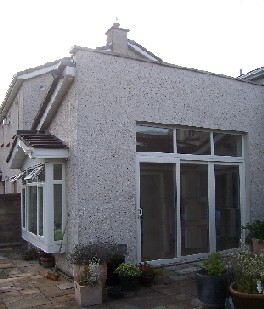 Project: Single Storey rear extension exempt from planning permission in Dunboyne, co. Meath Date: 2007 - 2008 Job Description: Design & Project Management. 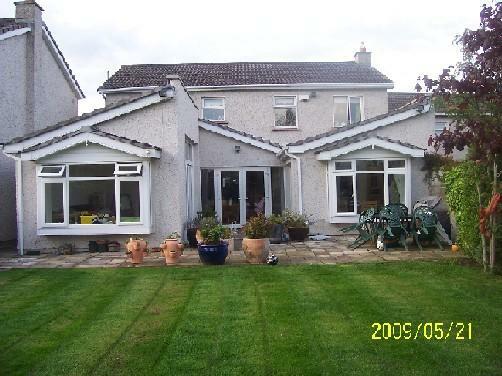 Our clients have a detached 2-storey dwelling part of a residential estate in Dunboyne, Co. Meath. They were willing to take advantage of their deep garden to extend at ground floor to the rear. They were looking for suggestions to maximise the internal space and natural light without the requirement of a planning permission. Answering to our clients' brief, we proposed a 39 square metres U-shape extension which includes the enlargement of the existing kitchen, a dining room and a playroom. The extension shape, its box windows, skylights and patio doors, maximise the amount of sun light entering the dwelling and create a relationship between the rear garden and the interior. The extension and its complex roof animate the rear facade which is orientated South-South-West. 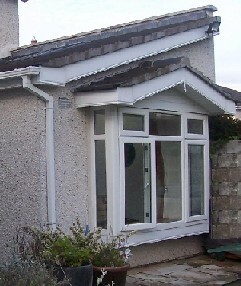 Our clients appointed a local General Building Contractor to build the extension. We provided the contractors with all the construction design, relevant specifications and contractual documentation. A shed made of concrete blocks had to be demolished and another was built before the construction work started around the dwelling. Delays have occurred due to damages to patio doors during their installation. However, the clients are delighted with the completed work.